Marine Midland Center office building by Miller & Favazzo Properties - quality real estate development and property management. 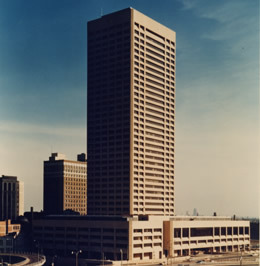 At the time this 40-story, 841,000 SF office tower was completed in 1973, it was the largest building in New York State outside of New York City. Designed by the San Francisco office of Skidmore, Owings, and Merrill, using large precast panels with exposed aggregate, the building bridges the 100-foot-wide Main Street in downtown Buffalo and is a landmark in western New York. In addition to being headquarters for Marine Midland Bank, it also housed other quality tenants such as IBM and Dominick & Dominick.